Home / Health / WHAT YOUR POOP SAYS ABOUT YOU. WHAT YOUR POOP SAYS ABOUT YOU. 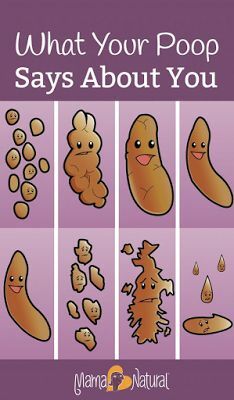 What do your poops say about you? This may sound like a joke, but you can actually learn a lot about your health from your daily doo. In this post, I’ll give you the full scoop… on what is and isn’t a good poop. Did your parents tell you what to look for? Didn’t think so. SO we wanna be sure that what’s coming out of the gut looks good. It’s best to have at least one complete bowel movement a day. You should feel like your bowels have emptied rather than just partially eliminated. Some people have bowel movements 2-3 times a day. This can be because of faster metabolisms, more robust good bacteria, or the quantity of food they eat. If you are eliminating more than 3 times a day, you are entering into the world of diarrhea which I will address next. Some people will say if you have bowel movements every couple of days it’s fine, but I disagree. This one of our body’s greatest ways to eliminate toxins, acids and other stuff, so it’s best to do daily. This is important, and it isn’t talked about often. We want to be sure our poops are well formed. This ensures we’ve digested and assimilated the nutrients from our food, and are eliminating acids and toxins properly. 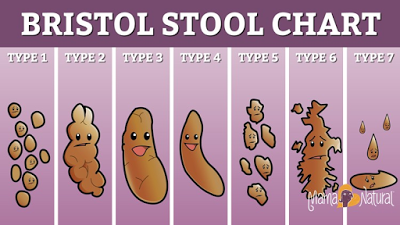 Here’s a handy reference called the Bristol chart to gauge your bowel movements. Can you guess where you want to be on the chart? If you said #4, you’re right! You wanna have nice tubular shape. Think long bananas that don’t break apart when you flush. The Perfect poop comes out with ease, smells more like super-ripe fruit than something terrible, and you barely need to wipe. Diarrhea is harder to control and typically stems from harder issues to fix. With diarrhea, you may also have a level of malabsorption going on so you aren’t getting the nutrients you need. These foods have qualities like tannins that can actually help firm up stool for better bowel movements. You can also consume a teaspoon or two of food-grade bentonite clay. This helps to bind and absorb toxins, and will often firm up loose stool. You also would want to take some good probiotics and eliminate irritants like gluten, wheat or too many grains, nuts or seeds until your gut is healed. If you find your stool is too hard or infrequent, you can also talk to your doctor about testing. Consider doing a full thyroid panel. Also, adding a little magnesium support to your diet can help tremendously. I like Ancient Minerals magnesium spray orNatural Calm magnesium. You can also add in some good probiotics, I like Prescript Assist soil-based ones. Cod liver oil and healthy fats can also keep things moving, and so can soaked chia seeds or other nuts and seeds. Pears are also wonderful – two a day will keep things moving. Yoga and abdominal massage are great tools. Other people have success using a castor oil pack on their abdomen a few times a week. Another trick you can try is to drop 1 drop of Peppermint essential oil into your toilet and sit down. It will stimulate your bowels and often result in a movement. Okay, we’ve talked about form, now let’s talk about color. Believe it or not, color matters! We want our stools to be a nice medium- to dark-brown color. Think milk chocolate. If your stool is black, it could be a sign of blood in your upper GI tract. If your stool is yellow or green, could be from fat malabsorption or liver or gallbladder stress. Drink beet kvass, Swedish bitters, or take HCL/Pepsin or other digestive enzymes to help you break down fat. Keep in mind if you eat beets, a lot of leafy greens, or food dyes, your stool color may change, and this is perfectly normal.